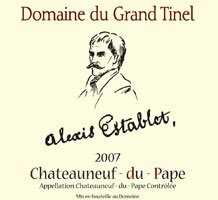 The Grand Tinel Estate is the fruit of two ancient families who were already well-known in the 16th century; Establet and Jeune. Five hundred years later, in the 1960s, the two estates became one when Christiane Establet and Pierre Elie Jeune married. 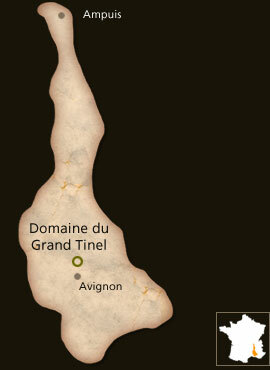 The Grand Tinel Estate was established in 1972. During the 16th century, “Grand Tinel” meant, in Latin, a keg or a cellar. At present, it means the aging cellar. The distinctiveness of this land lies in its rounded pebbles, which soak up the heat of the sun during the day and restore it to the vines at night. Thus, our grapes reach maximum maturity with characteristic robustness and powerful aromas. Our vineyard covers 74 hectares and is planted with vines of a ripe, old age in different varieties, such as: for the 56 hectares of Châteauneuf-du-Pape wines: Grenache, Syrah, Cinsault, Mourvèdre, and Counoise for the red wines, and Grenache Blanc, Clairette, and Bourbelenc for the white wines. For the 18 hectares of Côtes du Rhône wines: Grenache and Carignan. Cultivation at The Grand Tinel Estate is environmentally friendly; following strict measures kept in a schedule of conditions and regularly checked to see that all is done properly. This method accompanies a reasonable and limited use of natural fertilizers and products in order to preserve Mother Nature while resulting in a natural, quality product. Vinification is accomplished by complete destemming of the grapes, crushing and pumping into fermentation vats. Fermatation lasts between three and four weeks with temperatures controlled throughout the fermentation process. Then we drain the juice and press the pomace. A close eye is kept on the end of the fermentation process to guarantee wines of exceptional quality. During fermentation we do one to two pumpings per day with three or four emptying and refilling of the vats (for red wines only). Ageing the wine consists of repetitive rakings to clarify the wine. Throughout these operations, each vat is checked for taste. The wine is then transferred to oak barrels (old and new oak) where they remain for a minimum of one to two years. Composition of the Cuvee Grenache noir 80%, Syrah 15%, Mourvedre 5% Terroir Silica-clayish soils with rounded pebbles. Average Age of the Vines Plots of 30 and 50 years old Harvest Production 67,000 bottles. The picking, entirely manual, is followed by systematic sorting in the vineyard and after on a sorting table in the cellar. Vinification It is traditional with complete de-stemming. The grape varieties are wine-made separately. The harvest is de-stemmed crushed in full. Long vatting from three to four weeks. The temperatures are controlled throughout the alcoholic fermentation. Pumping over one or two times a day along with three or four emptying and refilling the vats during the fermentation. A daily tasting of each tank takes place in order to determine the date of devatting. Aging From 12 to 24 months in oak big casks and barrels. Bottling Estate bottled with our own bottling line. 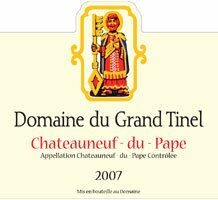 The limited cuvee (300 cases) of 2007 Chateauneuf du Pape Heres comes from 105-year-old Grenache vines. Enormously rich, broodingly backward, and somewhat monolithic, it reveals a dense purple color as well as gorgeously pure fruit, mouth-searing levels of tannin, and surprisingly crisp acids. It is a blockbuster in the making, but patience will be required. Anticipated maturity: 2013-2030.